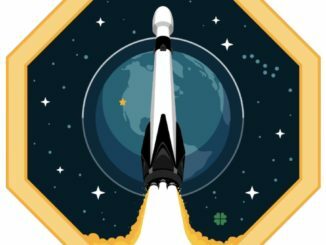 The module will expand to about four times its launch volume next month, beginning a two-year demonstration campaign to check the lightweight habitat’s resiliency to the harsh conditions of space. The automated Dragon cargo capsule approached the space station from below Sunday, pulsing its rocket jets to guide the spacecraft to a point about 30 feet (10 meters) from the complex, close enough for the robotic arm to reach out and grapple the SpaceX supply freighter. European Space Agency flight engineer Tim Peake took control of the Canadian-built robotic arm to snare the free-flying Dragon spaceship at 7:23 a.m. EDT (1123 GMT) Sunday. “Looks like we’ve caught a Dragon,” Peake radioed ground controllers. Dragon’s rendezvous with the space station came a day-and-a-half after its blastoff from Cape Canaveral aboard a Falcon 9 rocket. Engineers on the ground guided the robot arm to attach the Dragon spacecraft to the Earth-facing port on the space station’s Harmony module a few hours later. The Dragon cargo craft is now parked alongside Orbital ATK’s Cygnus supply ship, which arrived at the complex March 26. It is the first time two U.S. commercial cargo carriers have been at the space station at the same time. 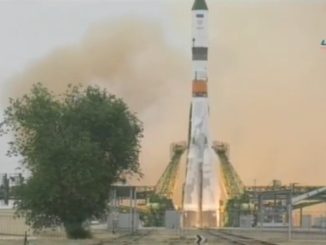 In total, six spacecraft are in port at the space station, including the two U.S. commercial supply ships, two Soyuz crew transport craft, and two Russian Progress freighters. That ties a record for the most number of visiting vehicles at the space station at one time, a mark first set in 2011 when the space shuttle Discovery, Europe’s Automated Transfer Vehicle, Japan’s H-2 Transfer Vehicle and three Russian spacecraft were docked at the outpost. 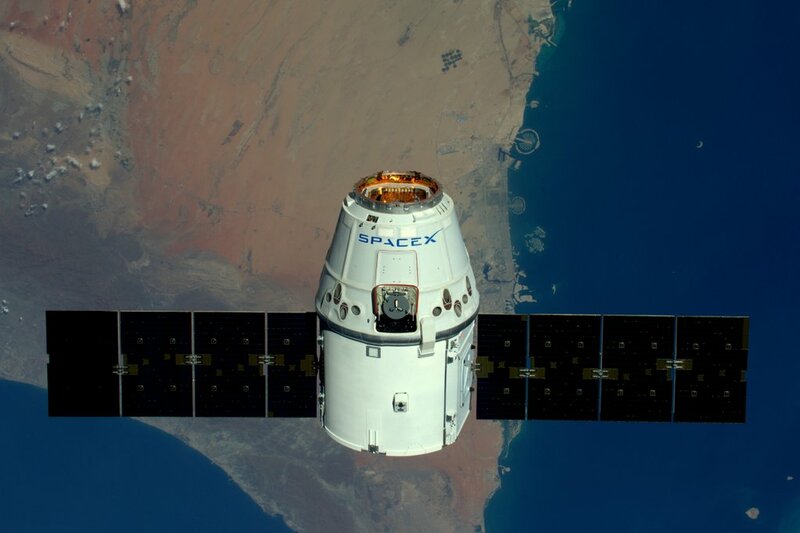 Dragon’s visit to the space station is also the first time a SpaceX resupply vessel, developed and operated under a multibillion-dollar contract to NASA, has flown to the outpost in nearly a year. Astronauts will enter the Dragon spacecraft Monday to begin unpacking nearly 3,800 pounds (1,723 kilograms) of supplies, provisions and experiments inside the capsule’s pressurized compartment. The experiments aboard Dragon include 20 female mice for an experiment developed by Eli Lilly, the Indiana-based pharmaceutical firm, to investigate how an antibody made in the company’s laboratories might inhibit muscle loss. Research investigations developed by secondary school students also arrived at the space station aboard Dragon, including a re-flight 25 experiments lost aboard a SpaceX rocket failure last year on the way to orbit. Two of the experiments from schools in South Carolina and Maryland finally reached the space station after falling victim to two launch failures — last year’s SpaceX mishap and an Antares cargo rocket exploration in 2014, according to the National Center for Earth and Space Science Education, the sponsor of the student payloads in partnership with NanoRacks. Research hardware delivered to the space station Sunday will help scientists keep track of microbes inside the outpost. A batch of Chinese cabbage and red romaine lettuce seeds also arrived inside Dragon to give the station astronauts fresh vegetables to go with their pre-packaged diet. Food reserves, clothing and computer equipment were also inside the Dragon capsule. The centerpiece of Dragon’s 3.5-ton cargo load is the Bigelow Expandable Activity Module, or BEAM, a pathfinder for future inflatable habitats that could form commercial space stations, ferry astronauts to deep space destinations, and even protect explorers on the surface of Mars. The 3,115-pound (1,413-kilogram) BEAM structure rode to the space station inside the Dragon spacecraft’s unpressurized trunk section. Robert Bigelow, founder of Bigelow Aerospace based in North Las Vegas, Nevada, is an evangelist for expandable space habitats. The real estate investor turned space entrepreneur plans to construct a huge commercial complex in orbit using the technologies to be tested by BEAM. Building on inflatable habitat work done by NASA in the 1990s, Bigelow is developing expandable modules 20 times bigger than BEAM that could launch as soon as 2020 to construct a standalone human-tended platform for rent by researchers, foreign governments, and even NASA. Inflatable modules have benefits in mass and volume, allowing designers of future crewed habitats to build larger structures that can launch within the envelope of existing rockets. “There are limitations to metallic structures in that the largest thing you could ever fly is what fits in the rocket’s fairing,” said Jason Crusan, director of NASA’s advanced exploration systems division. Operating the station’s robotic arm via remote control, ground-based engineers plan to pluck the module from the Dragon capsule’s trunk April 16 and mate it to the aft attach point of the Tranquility node. Made of proprietary space-rated fabrics, the experimental module is about 5.7 feet (1.7 meters) long and nearly 7.8 feet (2.4 meters) in diameter in its stowed configuration. 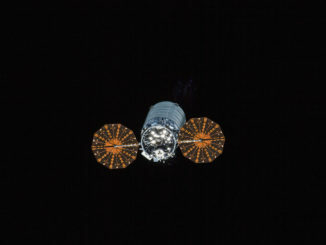 Bigelow described its shape for launch as similar to half of a soup can. The habitat is made of a Vectran-like material, according to Lisa Kauke, BEAM’s deputy program manager at Bigelow Aerospace. NASA used similar materials in the airbags that cushioned the landings of NASA’s Mars Pathfinder, Spirit and Opportunity rovers. Astronauts will send the command to inflate the new pressurized enclosure around May 26 and install sensors to monitor conditions inside the module, tracking temperatures, radiation levels, and impacts from tiny micrometeoroids and space junk, according to Rajib Dasgupta, technical integration manager for the BEAM demonstration at NASA’s Johnson Space Center in Houston. The inflation dynamics are an unknown, officials said. Sensors mounted on both sides of the module’s interface with the space station will measure how the deployment works. Bigelow Aerospace launched two small inflatable satellites in 2006 and 2007. Those missions, dubbed Genesis 1 and 2, performed beyond expectations, Kauke said. “What we learned from both of those programs is that the technology works, and we proved our materials and our assembly processes,” Kauke said. BEAM has a different shape than the Genesis satellites, and engineers subjected it to stricter requirements because it will be temporarily occupied by astronauts. Designers also adjusted the deployment mechanism to expand in length and diameter when inflated — not just in width as with the Genesis missions, Kauke said. The initial inflation will occur with air flowed into BEAM from the space station’s fans, Crusan said. There are contingency options for astronauts to go outside on a spacewalk to assist the inflation, and the module could be ditched overboard with the robotic arm if all else fails, officials said. When fully inflated, the station’s new room will span about 12 feet (3.7 meters) long and 10.5 feet (3.2 meters) wide. Its interior will have a volume of 565 cubic feet (16 cubic meters), about the size of a family-sized tent. Space station crew members will enter the module about four times per year to collect data drives from instrumentation monitoring the structure’s performance. The hatch to BEAM will remain closed at other times. There is no concern about the module’s shielding from high-speed strikes by microscopic flecks of rock and space debris that populate low Earth orbit. “There’s a reason why bulletproof vests are made out of soft goods and not rigid materials, and it’s the strength of materials and stopping power,” Crusan said. NASA is paying Bigelow Aerospace $17.8 million for the demo, which is due to last at least two years. Dasgupta said the module is built to last five years, but NASA wants to open up BEAM’s berthing port on the Tranquility module for other uses. Bill Gerstenmaier, chief of NASA’s human exploration and operations directorate, said last month that the space agency is eager to see the results of the BEAM demonstration. “Does it meet all the things that it’s purported to meet? It’s supposed to have better micrometeoroid and debris protection, better thermal protection, better acoustics, and we’ll see if it has those,” Gerstenmaier said. “We’ll also understand how to use a fairly large volume, which we have not had experience with. At the end of demonstration, the module will be detached and released with the space station’s robotic arm. It will eventually burn up during re-entry into Earth’s atmosphere.